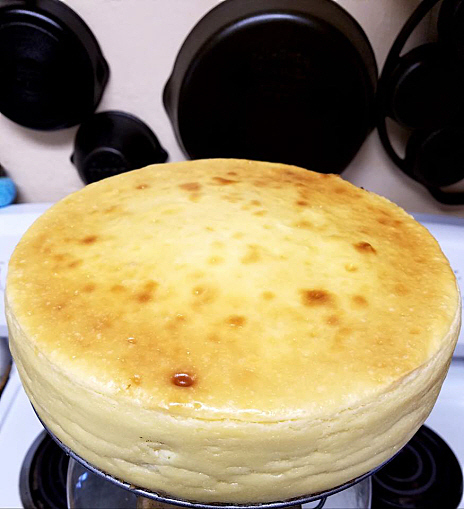 I have never froze a cheesecake and I'm wondering how to and how well it works. Just out of the oven and starting to cool. That's a nice looking cheesecake. I've frozen pieces of cheesecake but never a whole one. I assume the results would be the same. They survive freezing well. When I go to the renaissance fair , the serve frozen cheesecake on a stick. They shove an ice cream stick in a cut piece cheesecake, dip it in chocolate and freeze. Never tried it at home though, although I should. The school fundraisers sell frozen whole cheesecakes. They are sliced then frozen whole. Craig's brother used to make cheesecakes for a couple of restaurants. They sliced them up in individual sevings, wrapped the well cooled and set up cheesecake and froze them, then defrosted a few pieces each night for orders, taking more out of freezer as needed. They were just like the fresh pieces. Y'know S&P, I was just thinking the same thing. I found an open half box of graham crumbs! squashed it all back together, wrapped up tight and frozen. cut (you'd probably get nice clean cuts that way? ), paper, wrap and deep freeze ?? I cut my cheesecake with dental floss. I also cut soft cheese the same way. Dental floss works well. I choose to use a knife dipped in hot water between cuts. The paper helps prevent the pieces from sticking back together so yo ucan take individual pieces out easily, and also from the possibility of freezer burn/drying out.. I froze the whole cake without cutting it; in double plastic wrap and put it in a cake container, I guess I'll see what happens in a few days! I use a wet fish filet knive to cut slices without a problem. Thanks all for your input.